An open letter to Pope Francis, Sovereign of the Vatican City. But their ultra-violent methods aim to provoke social segregation and retribution, a clash of civilisations. They hijack religion in an attempt to make their movement look vast, when it is in fact extremely small. Knowing this, your commitment to interfaith dialogue and understanding has taken on a deeper meaning as Daesh (aka ISIS/ISIL) turn greater attention to attacking the social fabric of Europe. Daesh depend on a highly simplistic narrative of Christian versus Muslim, Shia versus Sunni and Muslim versus Jew. They are supremacists who wish to destroy any Muslim sects who differ from their crazed vision. Unless we actively fight this narrative, the extremists can cause lasting distrust and division within our societies, and challenge the essence of democracy. It is this division that can manifest itself not only in violence, but in attitudes of hostility against Muslims and Christians alike. Unfortunately, it is this social division that I encountered on a family holiday in Spain earlier this month, when a peaceful trip to the Mosque-Cathedral of Cordoba ended in my family being harassed off the premises by security guards. The incident happened at the end of a beautiful week long family holiday in Spain, and like thousands of other tourists, we decided to visit the famous multi-faith site, that was for a time both a Mosque and a Church. Unfortunately, some people in Spain are determined to erase the multi-faith heritage of this site, and it is now clear that my family had a very unpleasant encounter with some of these people, who wish to uphold a ban on Islamic prayer there. While attempting to pray, I was forcibly pushed by a security guard who then proceeded to harass my family, call for backup (despite our perfectly polite response) and follow us intimidatingly out of the building. On my part, it was a small act, in a corner of a vast room, 200 yards from where Christians were allowed to pray, and was done so silently and discretely. Nobody would have heard the prayer. With my family present, it should have been clear that we were no threat to anyone. But even my wife, resting on the floor after a long day of sightseeing, was aggressively told to move on and security ensured that we leave the area. Many other women in the building were also resting on the floor, but my wife was singled out. As the security guard pushed me, my 3-year-old son asked him to "leave daddy alone, he is praying." I only hope that the discrimination that he saw that day does not become a formative memory of his first trip to Spain. It certainly isn't the Europe I know. My experience and that of others (which may have gone unreported) may constitute a positive opportunity for His Holiness to emphasise interfaith relations. Now is the time to act decisively on the issue of inclusiveness of prayer in all houses of worship. 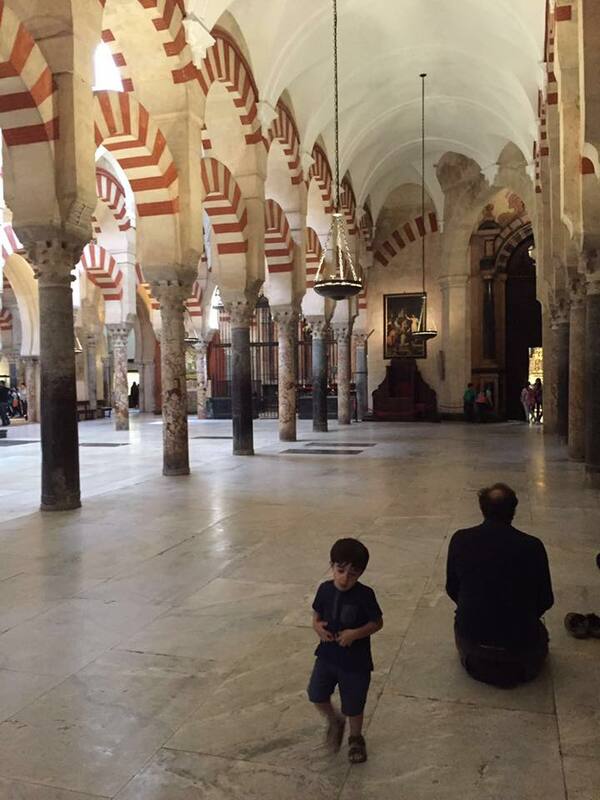 To that end, allowing Islamic prayer at Cordoba Mosque-Cathedral would be highly symbolic, something extremists across the political spectrum would fear. At this critical juncture in our collective history, it would be an important victory for peace. This is because when faiths display tolerance of each other in symbolic acts, it is the polar opposite of what Daesh want. It also damages the cause of the terrorists' best friends: the Far Right in Europe and North America, and the Far Right "lite" of Donald Trump. Yes, it is right to say the Far Right are their best friends. Without the Far Right mobilizing after every atrocity, be it in Paris, Brussels or London, the extremists' work is only half done. Segregation is their narrative, and there are few symbols more powerful than faiths united in a place of prayer. So when St. John's Church in Aberdeen opened its doors to the local Muslim community in 2013, it was another blow to terrorism. When no less than 80 Mosques in the UK opened their doors to the British public, it was yet another stab at the terrorists' stupidly simple narrative of inter-communal warfare. And in Iraq, my home country, when tens of thousands of Christians fled the Daesh offensive of June 2014, they could find safe haven in the Shrine of Imam Ali in Najaf, one of the Holiest sites in Shi'a Islam. This is the polar opposite of what Daesh want. Delegations of Iraqi Sunnis have also been welcomed at our Holiest sites, a highly damaging image for Daesh and al Qaeda. And of course, it would be historically fitting to allow Islamic prayer in the Mosque-Cathedral. Certainly, Cordoba in the 10th century enjoyed a fascinating cultural period which saw the Jewish diplomat Hasdai Ibn Shaprut (d 970 AD) establish an enduring relationship with caliph Abd al-Rahman III. This was a time that witnessed an astonishing cross-pollination of Hebrew and Arabic literature, the kind of religious overlap that had previously been seen in Iraq in the 5th century, in the form of the traveling Jewish writer "Ezra the scribe" (Uzair in the Quran) who has a shrine today in Al Amarah, Iraq. Of course, Cordoba is more famous than Ezra's tomb, being a World Heritage site since 1984. Built in 784 AD, the Mosque reached its heyday in the 10th century during the Umayyad caliphate which stretched into southern Spain, until Ferdinand III transformed the Mosque into a Cathedral in the 13th century, preserving its magnificent Moorish architecture, a forest like internal structure of hundreds of pillars and arches. But while in Cordoba, I believe my family encountered people who want to erase some of this history. In November, a local Far Right party called Vox held a demonstration arguing that unless the word "Mosque" was removed from the name of the Cordoba Cathedral Mosque, it would be a "victory for Jihadism." The reality is quite the opposite. Therefore, if His Holiness does not distinguish between houses of God and the freedom for all faiths to worship in those houses, then why should I be prevented from worshipping in Spain or indeed any other country where the predominant faith is Christian? It is sad that things have come to this, but it I believe that the efforts of an international campaign to preserve the multi-faith status of the site, which has won 400,000 signatures on Change.org, is a positive step forward. Furthermore, the local council has recently rejected a claim of ownership of the site, affirming its World Heritage status as a priceless historical structure beyond the concept of ownership by one organization. I believe we are far beyond the times of religious discrimination, something I witnessed on my family outing that was not reflective of the Europe I know. The Abrahamic religions subscribe to the unity of God, so prayer in any house of worship must surely be a fundamental human right. Certainly, it should be upheld as a right in Spain; in the Spanish Constitution of 1978, Article 16(3) states that "No religion shall have a state character. The public authorities shall take into account the religious beliefs of Spanish society and shall consequently maintain appropriate cooperation relations with the Catholic Church and other confessions." Perhaps it was for this reason that authorities were afraid to write a sign instructing Muslims not to pray at Cordoba Mosque-Cathedral. Entering the Mosque-Cathedral, I noticed that the authorities clearly did not have any legal authority to stop you praying pursuant to you accepting the terms of admission to the site. In fact, the only three "NOs" on the visitors leaflet were, "No revealing clothes, No Pets, and No Food and Beverages are allowed inside the site." So what is banned is an act of free thought, and thought crime belongs in Europe's dark past; let's keep it that way and keep Europe an open, free society, making Córdoba not only a symbol of European tolerance, but a symbol of our times. I hope one day to return to Córdoba and complete my unfinished prayer, which was incidentally, for peace on Earth and greater understanding among mankind.